Harry J. Gruener has been practicing law for over 35 years and concentrating in Family Law for more than 20 of those years. Professor Gruener is a founding partner of the Pittsburgh family law firm of Goldberg, Gruener, Gentile, Horoho & Avalli, P.C. Professor Gruener has been an adjunct member of the law school faculty for many years before joining the fulltime faculty. He designed and has taught the Advanced Family Law Advocacy class, the Advanced Family Law Drafting class and the Family Law Clinic. 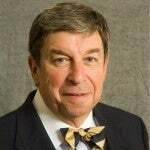 He has written and lectured extensively in the field of Family Law and has chaired the Allegheny County and Pennsylvania Bar Association Family Law Sections and has been President of the Pennsylvania Chapter of the American Academy of Matrimonial Lawyers. He has participated in drafting Amendments to the Pennsylvania Divorce Code and other significant Family Law legislation. In 2005 Professor Gruener received the Law School's Excellence In Teaching Award, and in 2012 he received the University of Pittsburgh Chancellor's Distinguished Public Service Award. Board Member, Neighborhood Legal Services, Law School Representative on Board of Directors. Representative, ACBA Family Law Section.